Paypal is the fastest away, is very easy and safe. 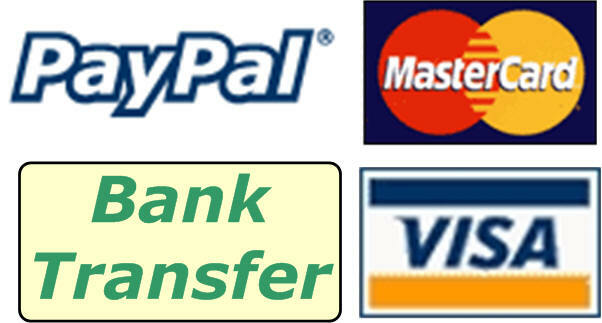 Through PayPal you can make worldwide, fast, secure and easy payments with your credit card or bank account. All you need to do is sign-in with Paypal and link your checking account and / or credit card to your Paypal account. When you choose the option bank transfer you will receive after placing your order a confirmation e-mail with your order number, & the amount that must be paid on our bank account. Once we have received your order with the total amount we will generally ship the items the same day. • Please allow one to three business days book time. • Pay when you want. Note: If you choose to pay, the products will be held for 7 days for you. If the total amount is not received within this period, the reserved products are again available for other customers. Are you living in Belgium, Germany, Switserland, Austria or Poland? Now you can pay for your purchases at Lady Habits via the familiar Sofortbanking (formerly Direct Banking). All your payments are real-time and easily via a secure environment. Are you living in Belgium? Now you can pay for purchases through the familiar Bank / Mister Cash you. This payment option is similar to iDeal in the Netherlands. All transactions are processed in real time via the secure payment page of your own bank. So you get also provided a bank card with a personal PIN code. If you want to qualify for this, you can contact your current bank.